String theory is a theoretical framework that unifies all particles and forces in Nature, including gravity, in a way that is consistent with quantum mechanics and relativity. String theory can be used to address a number of deep questions in fundamental physics, including black hole physics, early universe cosmology, particle physics phenomenology and quantum information. 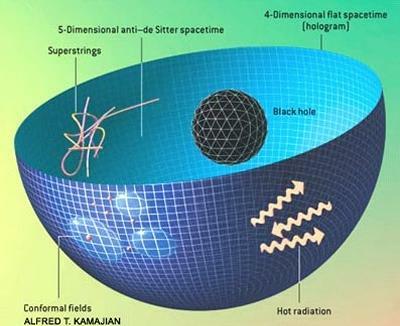 Much of modern string theory uses heavily the concept of holography: holography states that any theory of gravity can be described by a theory without gravity in one less dimension. Holography relates the quantum theory of gravity to an ordinary particle physics theory with no gravity. Holography is an important tool in addressing longstanding puzzles in black hole physics, and also in constructing new mathematical models for cosmology, condensed matter physics and strongly interacting particle phenomenology. The Southampton group has a wide range of research interests, ranging from the fundamental building blocks of string theory to applications of holography. Our research topics include the structure of string amplitudes; pure spinor formalisms for string theory; integrability and the structure of gauge theory amplitudes; black holes in higher dimensions and their stability; holography for black holes and relation to quantum entanglement; holographic models for cosmology; applications of holography to QCD, astrophysics and condensed matter physics; conformal field theory; non-perturbative quantum field theory and the renormalization group. Contact group members for possible PhD projects in relevant areas.